I love vinegar, from balsamic to apple cider to champagne. It’s a taste I developed as a child and has stuck with me ever since. So it’s no surprise I love anything pickled. Too bad I didn’t develop patience too. This quick pickle recipe is perfect if you are like me. It’s quick, about as simple as it can get and (most important) crunchy and tasty! Using raw honey is so much healthier than a refined sugar. Refined sugar is a “negative” nutrient. This means it literally does not have any nutritional value and eating it actually makes your body use up stored nutrients to process it. Honey, on the other hand, has many beneficial nutrients, enzymes and antioxidants. Raw honey is best. Typical honey processing (the kind of honey you’ll find at your grocery store, often shaped like a bear) destroys many of the enzymes and antioxidants that give the benefits of raw honey. Save a bear; use the raw honey. Next time you have an extra cucumber or two, slice them into these delicious honey pickles for a super Fat and Happy addition to any meal. Peel the cucumbers and slice relatively thin. Place the slices in a colander sitting over a bowl and toss well with the salt. Set the colander and the bowl in the refrigerator for one hour. This will pull extra liquid out of the cucumber so they don’t get too watery. (If you are in a real hurry you could skip this step). In the meantime, simmer remaining ingredients for about 10 or 15 minutes until reduced by about half. Cool. 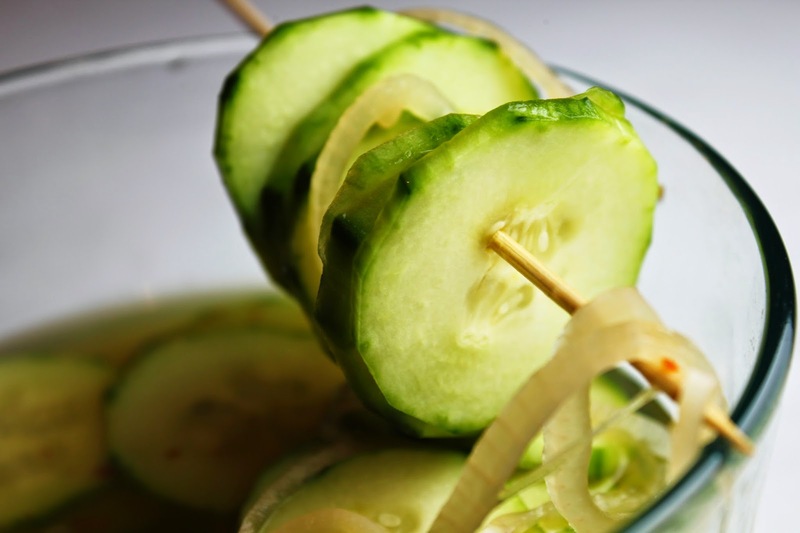 Toss the cucumber slices with the vinegar mixture and let steep for at least one hour or overnight. The longer they sit the better they get. Fat and Happy Food Blog Tips and Techniques: Use a mandolin for consistency. I like to slice one cucumber at the thinnest setting and one at the next setting for a texture variety.